The Cat Tree Paradise XXL (Grey) is a brand-new product for 2018 which we are incredibly excited to announce! This absolutely stunning, strong and mightily sturdy cat tree comes at a whopping weight of over 80 kg.. 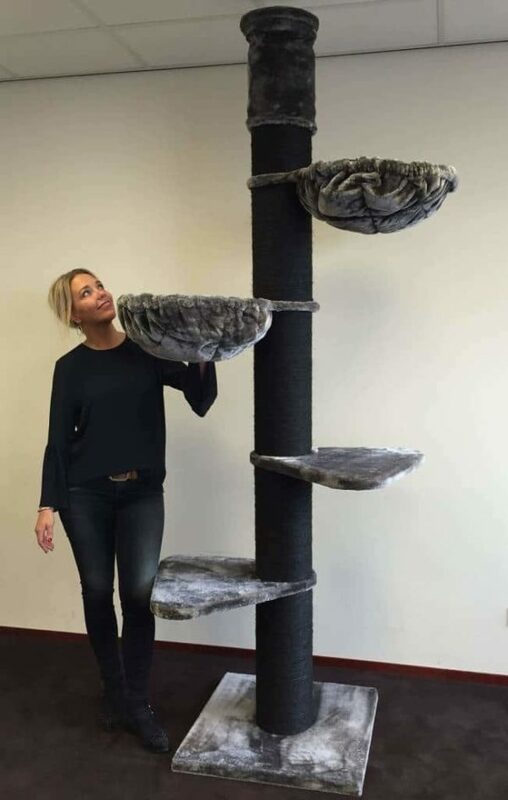 This is one of the heaviest cat trees that we have and as a result, this allows the kitty construction to be completely unmovable and one of the sturdiest cat tree available on the market today. No matter how large your feline friend / friends are, you can be assured that the Cat Tree Paradise XXL (Grey) will remain in place at all times and provide a safe environment for your feline friend to be able to explore, climb and play. The Cat Tree Paradise XXL (Grey) has been expertly designed with one of the most spacious cat houses you can find which incorporates multiple levels that provides a private ‘paradise’ for your cats to be able to escape to, whenever they desire. Situated above the spacious kitty condo are two luxurious hammocks which provides some additional height and an open view of the surrounding area. Not only do these make absolutely beautifully cosy sleeping spots. But, they are fantastic for perching and allowing your feline friend to have a majestic view of everything around them. They will never feel like they are missing out on any of the action.. If they are brave enough to be able to make it to the very top of the Cat Tree Paradise XXL (Grey). Then, another large and spacious bedding area which can comfortably hold a couple of cats awaits them.. The sisal scratching posts have a whopping diameter of 15cm and have been made from high-strength wooden tubing, making them extremely robust and will last for many years to come. If all of this wasn’t enough, then a small and chunky playing rope enticingly dangles down from underneath one of the stepping platforms which will keep your cats amused at all times! Required Minimum: 119x70cm (with hammocks turned inward). Playhouses: 50x60x91cm Exterior covered with sisal cover. Holes at the front and sides 25x18cm oval. Hammocks: Rotatable and 45cm lying surface and tested up to 20kg carrying weight. New model 2018. Combination so hammock and cushions. This RHRQuality cat tree comes in 3 boxes.